For a multitude of reasons (including my propensity to pull unintentional pratfalls of physical-comedienne proportions and an unfortunate tendency to rest my clasped hands on top of my head for no good reason) I just don't do strapless (or even spaghetti straps). This can be a hardship at holiday-party-dress time, when it seems as if there's a law against having more than three square inches of fabric above your sternum. The only bad news is that this dress is nearly $800 … that's, well, a LOT. Click on the image to visit the Elizabeth Charles online boutique, where it's being sold. I'm pretty sure I've seen this neckline on at least ONE of the umpty-billion vintage patterns I have. And I have some really, really nice green satin … now all I need is a good excuse to wear it! Thank goodness for holiday parties. 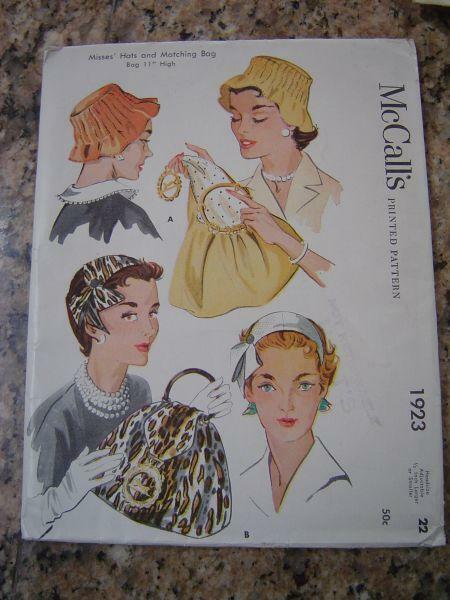 Pam sent this link to one of her hat patterns that's up now on eBay — I love this lampshade style, very cute! She's also got a glove pattern up now that I'm terribly tempted by (but, sadly, it's not my size). For some reason I want to make brightly-colored ultrasuede gloves (as if I didn't have enough projects piled up — I'm like the Collyer brothers of projects at this point). I haven't made very many hats; I made one from a modern Vogue pattern in chiffon, to wear to a wedding once, and I've embellished a few felt hats (and I'm very sad that Manny's Millinery Supply has either closed or moved; anyone have a good source for premade felt blanks?). I have been tempted by hat-making, certainly, but I've not yet reached the point where I need to invest in hat blocks. Yet. I'm sure that day will come! Nora sent me this pattern. 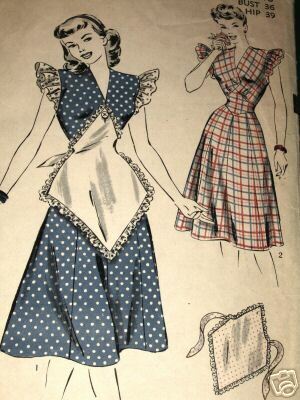 I probably wouldn't have looked twice at it if someone hadn't sent it to me; I'm not a huge apron aficionado, and this is a little earlier, decade-wise, than the silhouette I'm usually hunting for. However, this pattern's eBay auction will be over really fast (like, tomorrow) and I have about six dozen projects in the "urgent: sew me next!!!" pile, so I'm passing. 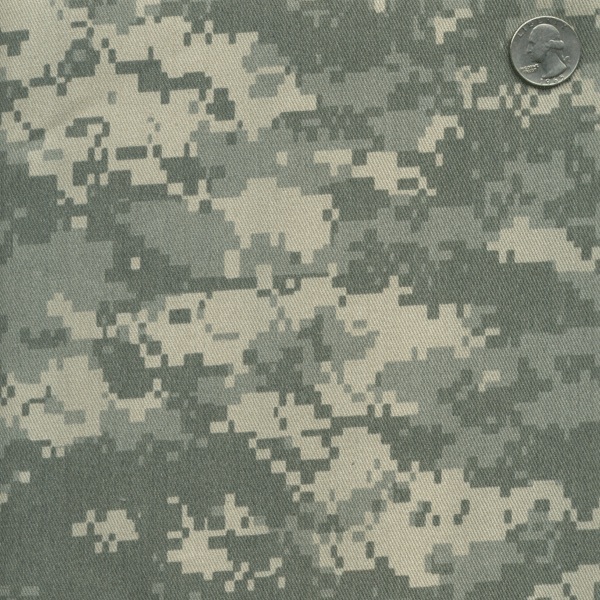 If you buy it, and make it in camo, send me a picture, okay? 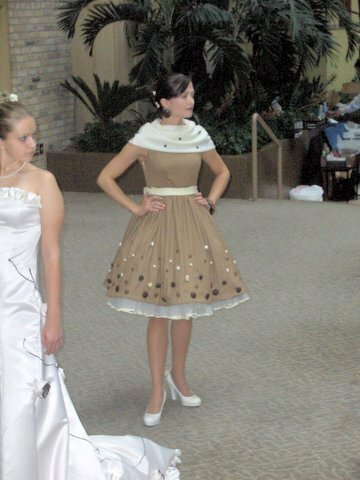 I know it sounds like a bad this-is-what-girls-like stereotype, but this dress is made (at least partly) of chocolate. 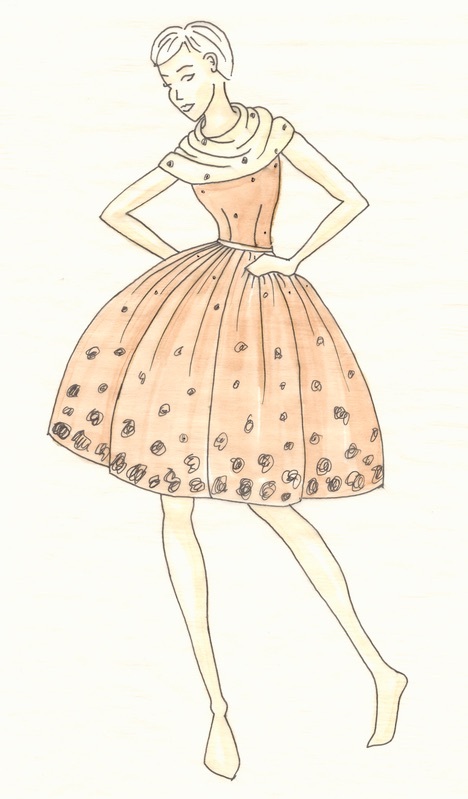 Amy sent me the link to this dress (from the LJ community Sew Hip). The dress was part of a contest at the Twin Cities Chocolate Extravaganza, and was created by LJ blogger redheadedchick, a student in the Fashion program at the University of Minnesota. The belt, the bows on the shoes, the bracelet, and the dots on the dress were all chocolate, made by a pastry chef who was teamed up with redheadedchick for the contest. Supposedly the room was warm (occasioning some anxiety) but everything held up except the belt … which the model cleverly held up herself with her fashion-y hands-on-hips pose. I'm thinking about making a series of posts over the next couple weeks with suggestions of lovely (as India has it) Ramakwanzachanamas presents. 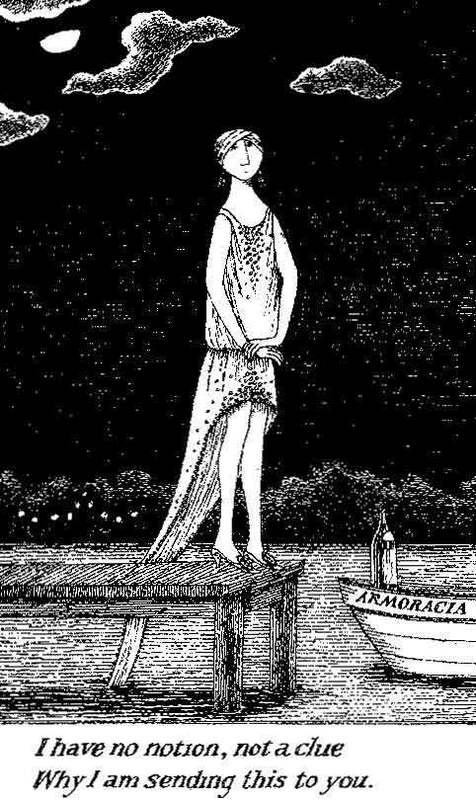 One book that I would think anyone of any sensibility at all would thrill to receive would be Amphigorey Again , the latest collection of Goreynalia (a posthumous one, which is strangely appropriate). I mean, whose tastes DON'T run to morbid situations featuring beautifully dressed ectomorphs? Anyone? The dresses in the "Neglected Murderesses" series of postcards alone … those dames knew how to dress, as well as dispatch. If you have suggestions for things you think I ought to recommend, well, you all know where my email address is by now, or you can leave a comment … I'll try to do these in addition to the Regularly Scheduled Dresses, if I can. Su-Ying sent me a link to Ageless Patterns, where I found this beauty (which is, in fact, from Decades of Style; click on the image to visit their site). Doesn't this look like the bodice to a new and exciting Duro-style dress? 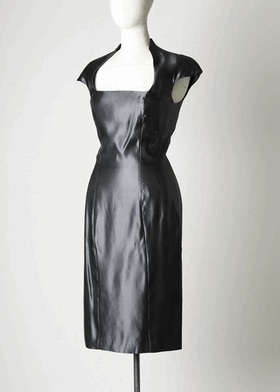 After doing some due diligence I think I'm going to buy this one, and convert it into a dress. I think I can Frankenstein the skirt from the McCalls Duro (which I love) and have a fun new variation! I love that the sleeves on this one are a bit narrower, and the neckline a bit higher. To put the other skirt on this bodice, I think that I will (and I'm VERY happy to hear alternate suggestions) take the midriff pieces of the other bodice and true the bottom of this one to it, then proceed from there. Don't worry, I'll make a muslin … and I think I'll probably lengthen the skirt a bit, to give it a more Edwardian feel. 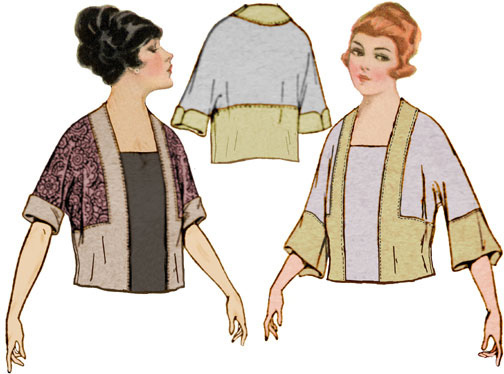 I'd love to make one in brown and cream, as I have a pair of brown and cream spectator shoes that would be a perfect complement … I also have some gorgeous green velvet that I could find a green jacquard to match, if I wanted to be fancy. I still haven't done the Big Duro Roundup, but I have high hopes of taking some pictures over the holiday. And, speaking of which, I won't be posting Thursday-Friday-Saturday-Sunday, as I'll have lots and lots of houseguests! My husband is doing the actual cooking (turducken, baby!) save for the pies, which are my bailiwick. So tune in tomorrow, but after that I will be taking a tryptophan-induced break for a few days. 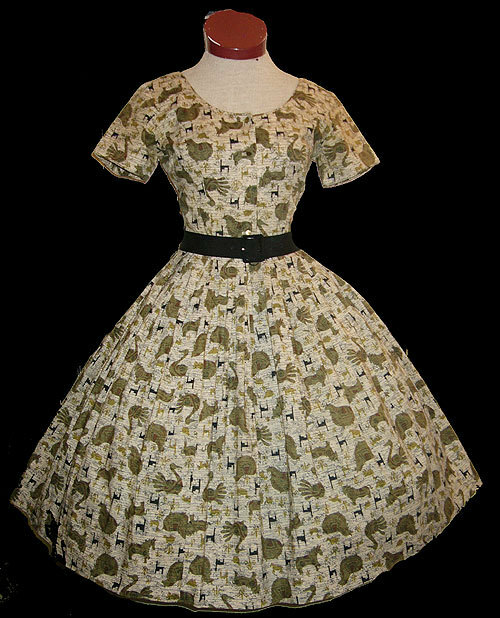 Julie keeps up her Dress A Day fodder streak by sending me this turkey dress (which is substantially different from "a turkey of a dress"). Sadly, you wouldn't be able to get this in time for Thanksgiving — the auction doesn't end until midday Wednesday. If you already have a turkey-themed Thanksgiving dress (those of you in the States, at least, it's a little late for Canadian Thanksgiving at this point) more power to you! I am not trying to universalize my experience of holiday-themed clothing. However, don't, if you can help it, go this far … I beg you.